Like splashing cold water on my face or waking up to an obscenely loud alarm clock, or maybe even being submerged into a dunk tank. That is how I feel right now. Eyes and heart wide open, an overwhelming sense of spiritual humility. Wake up! Alarms are sounding it is time to wake up and RISE! The condition of the mind or living with the feeling of being ‘satisfied’ or ‘gratified’ leads to a condition of ‘forgetting God’. So easily we can fall into the routine of our day to day and allow the busyness of life take over. Going through the motions, going to church, reading your bible even praying, but then you are not actively pursuing God with your whole heart, then that is all it is; going through the motions. While I can report that I have successfully read the entire bible it was cover to cover; unfortunately I admit this was more for the satisfaction of being able to say I read it rather than truly learning God’s word. 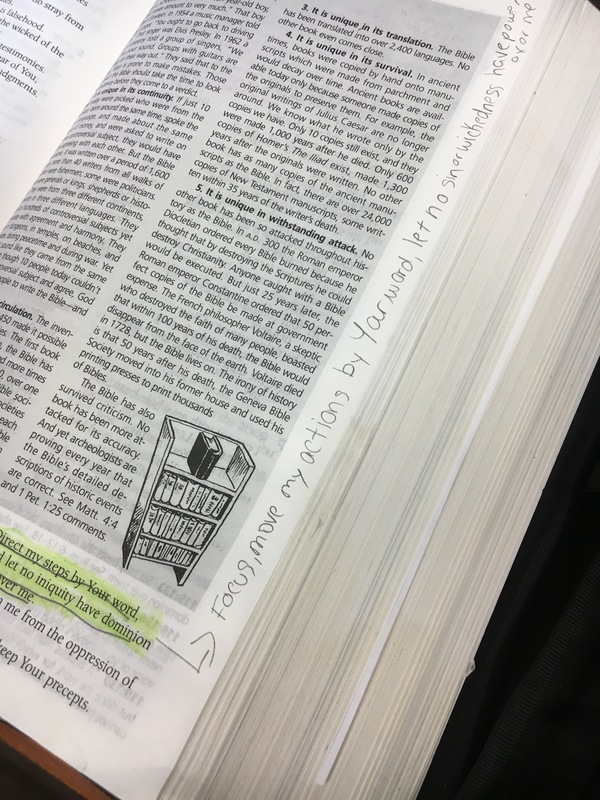 I certainly feel like I was not focused in my reading process at that moment in time; it was more of going through the motions and not so much learning and loving God’s word. For the last year I have been following a chronological reading plan to read through the Bible in a year, I’m not sure I have even made it halfway yet. While I have not been disciplined enough to keep up with this daily but I am taking my time and not rushing through it. 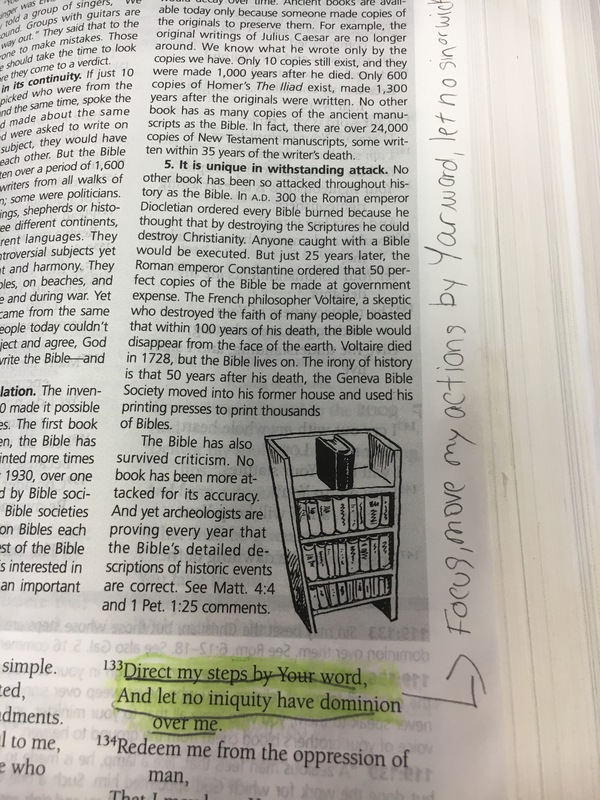 I will read the outlined verses and go to the study bible for additional information. I am taking time to review information for each chapter that I come to in an effort to deepen my understanding. I will then later listen to them on my audio bible to follow up and reinforce what have already I read. 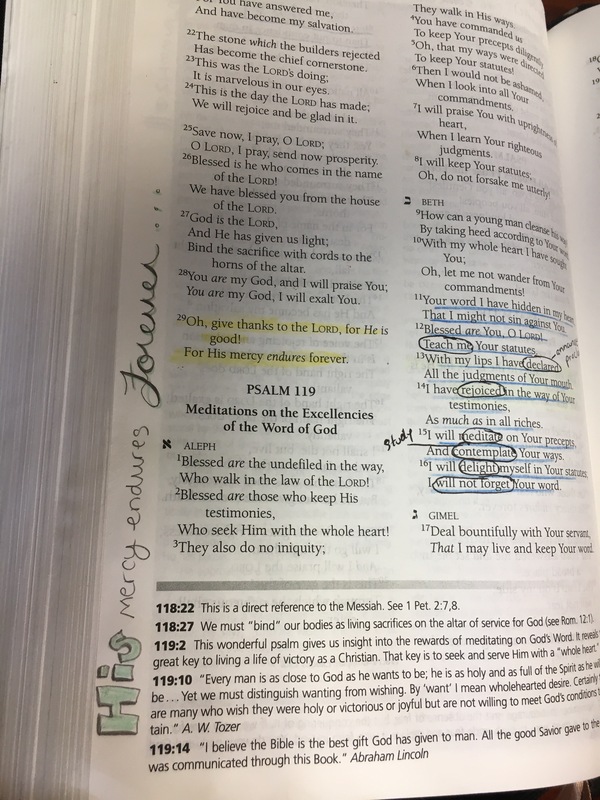 This week my scripture reading has led me through part of 1Chronicles and Psalm 119. 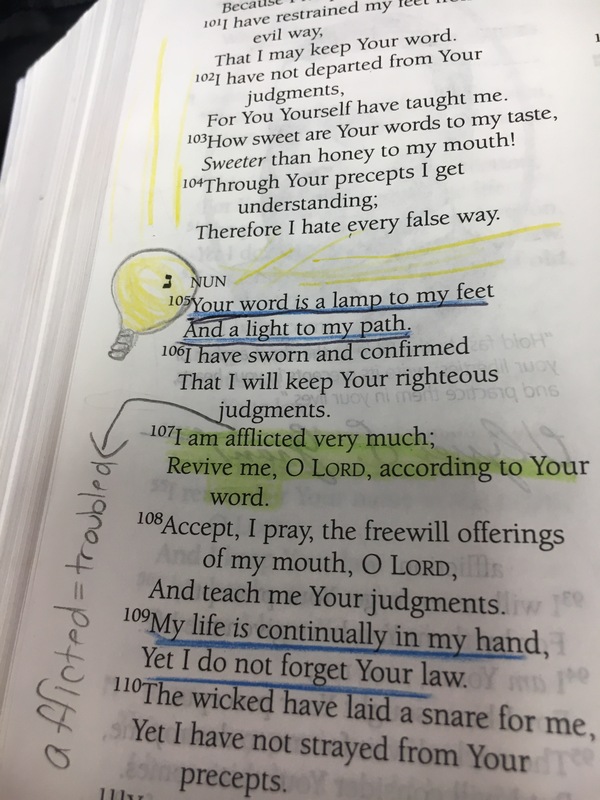 This week I find myself paused and rereading parts of Psalm 119 and then reading it again. Those who walk according to His law and seek Him with all their heart are not blessed because they will have an easy and luxurious life with worldly desires fulfilled. In fact quite the opposite, they will likely have many trials and attacks from the enemy as the seek the Lord and follow His ways. Those who follow His laws and seek Him with their whole heart will be blessed in their relationship with Him, with joy in His love and salvation despite their circumstances and trials. Some of the important reminders that I am taking away from this weeks scripture reading and study is this…. Obedience- must be obedient to God’s law because I love Him and want to please Him, not because it ‘I have to’ or it is what is expected. —–>Psalm 119:7-9 I will praise you with an upright heart as I learn your righteous laws. Memory- I need to continue to actively commit His word and truth to memory so that I can always recall His works. I am doing this but I could be putting more energy and effort and approaching this ‘wholeheartedly’. Meditate and study His word, EVERY DAY with true desire. —–>Psalm 119:11 I have hidden your word in my heart that I might not sin against you. Distinguish ALL BLESSINGS as flowing from God’s grace. There are so many of His gifts and blessings we take for granted everyday. Continue ‘counting my wins’ each day and be more intentional in giving that glory for God, thankful to Him for all things. —–>Psalm 119:18 Open my eyes that I may see wonderful things in your law. Trust God, walk in His ways not my own, surrender, less of me more of Him. —–>Psalm 119:37 Turn my eyes away from worthless things; preserve my life according to your word. Each day choose GOD, choose to love Him, to learn and follow His laws, find my delight in Him and not the circumstances of my moments. —–>Psalm 119:44 I will always obey your law, for ever and ever. Be confident in waiting for God, his timing, He is in control, do not fear for the evil of man for God is faithful, His mercy endures always, keep my faith in Him, he will not forsake me. —->Psalm 119:50 My comfort in my suffering is this: Your promise preserves my life. I have power over sin with the strength of the Lord, wholeheartedly place my petitions and needs to Him and He will direct my steps. —–>Psalm 199:133 Direct my footsteps according to your word; let no sin rule over me. His Word and law is essential not optional to truly surrender to Him, the Word of God is WONDERFUL. —–>Psalm 119:137 Your laws are righteous Lord, and your laws are right. Victory in Christ, I have victory in Christ on the good days and the bad days, I will actively seek and serve Him with my ‘whole heart’. What an awesome reminder the scripture has brought me this week.